When it comes to Taiz, what am I supposed to do? What can I write? Shall I write true stories of those torn apart and emotionally distraught mothers who lost their sons, husbands or even their daughters? Or shall I write about the suffering of this great City that was bullied by one of the wanted criminal in Yemen? Or shall I write of how beautiful this country was or about the struggles of this City? Whatever I write it is never enough to show the horrific scenes this city is faced with and never enough to show how this city made a difference in Yemen. We Yemenis say Thank you Taiz, Thank you for starting something that should have been started many years ago. Thank you for standing against corruption, Thank you for your struggles to give Yemen Freedom, Thank you for the heroes you have lost for the sake of a better a better Yemen. Thank you simply for being who you are and remaining strong and brave. Of course Thank you is still not enough but it’s the least we can say to this city and the people of this City. 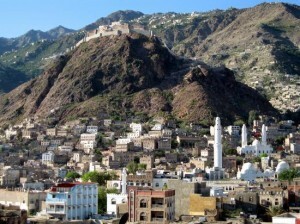 Taiz is Yemen’s third largest city and the Heart city of Yemen’s peaceful Revolution 2011. The peaceful Revolution started from Taiz where the response to it wasn’t very nice since the start of the Revolution. Since it was the first city that came out demanding for freedom and basic rights, the corrupt regime of the Ex-president Ali Abdullah Saleh did not answer back peaceful, like it should be. But since the start of the Revolution that City has been harshly bullied by this regime. This is the city that stood strong while being attacked nearly on a daily bases, this is the most suffered city from this Regime during this peaceful Revolution. This is the city that was massacred on May 26, 2011. That day the freedom Square of Taiz was attacked, the tents in the sit-in area was set on fire, which burnt the whole tents, Many people died, some people on wheel chairs couldn’t run for their life, they were burnt alive and there was many injures. That day, to many Yemenis especially from the city of Taiz who witnessed the scene can never forget that day. From this city, the first woman was killed by this regime, Azizah Othman from Taiz, the first Yemeni women to be killed by the current regime and many more women followed her. Taiz the city that had the most lost from the beginning of the Revolution, Lost their men, their women and their children. Right up to now this city is still being bullied, on November 23 the GCC deal was signed by Saleh… Right up to now I and many Yemenis don’t know what Saleh agreed on. All I know is that the GCC deal is supposed to be standing with the people of Yemen, but that is not how it is. We haven’t seen any good changes since the GCC deal was signed apart from more violence. What does that tell us? The truth is that this Deal is only there for the favour of Saleh. After the GCC deal was signed, a day after, Taiz was shelled by Saleh’s forces. Wasn’t violence supposed to end now that the GCC deal was signed? This deal did not do anything for Taiz that has been suffering from this Regime for now crossing 10 months and neither did it do anything for the rest of the country. Right up until now as I am writing this Taiz is still being attacked the most. Taiz did not only become the heart city of the peaceful revolution but also the bleeding heart of Yemen. My pain for Taiz is too deep to the point where I can’t cry anymore, I can’t cry for those women that are being killed one after another, or for the children of that are being killed before they have reached their teenage years. I want to cry to bring me back to reality but what’s the point, what are my tears going to do? I want to scream ‘Help Taiz’ but who is there to hear the cries of Taiz or to see the blood of Taiz? We won’t forget you Taiz, like it’s usually said where every story begins; it’s where every story ends. Saleh and his regime won’t end you or our Revolution; you are the city that is keeping our Revolution alive.